Skyline club in Southfield MI is the perfect Detroit wedding venue to host every aspect of your big day. 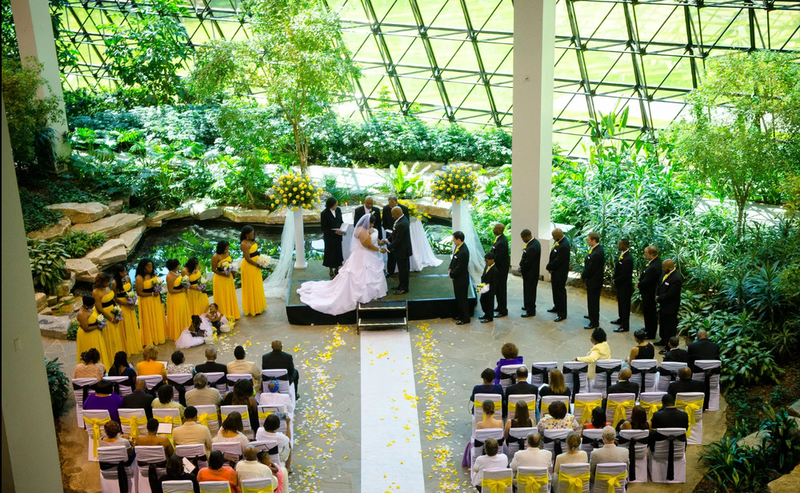 The main attraction is the atrium with a beautiful glass screen surrounded with greenery that gives an outside feel while you enjoy the inside warmth; perfect for a ceremony. Our brides also love the Renaissance room which has spectacular panoramic views of the Northeast side of Metro Detroit. Providing delicious in house catering, the skyline club has a capacity to accommodate 150 seated or 200 strolling guests. Comerica Park has already played host to Weddings...bar/bat mitzvahs, product launches...corporate meetings, speaker events...press conferences, holiday parties...fundraisers...luncheons "team building" exercises, corporate retreats...breakfast meetings and more! The Tiger Clubs has a private entrance on Wetherill, a beautiful view of the Comerica Park field and scoreboard and an attractive exposed-steel and wood decor.